Over the Top, while a box office failure, serves as a great work highlighting the human spirit that can drive the proverbial David to beat their monolithic Goliath. 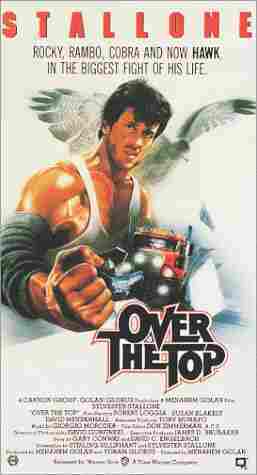 Sylvester Stallone plays Linclon Hawks a trucker, a father, and an armwrestler. Lincoln Hawks has a past of mistakes and misfortunes as most true to life characters have. Lincoln Hawks' son has been cared for by his grandfather for so long that the grandfather starts to think of the son as his own rather than that of his own son, Lincoln. Without money, Lincoln stands little chance of winning a custody battle for his son. Nontheless he perseveres. The battle that will determine the future is an armwrestling tournament and its available rewards. The armwrestling scenes of the movie feature truly unique and wonderous characters. One chews on his own cigar and then swallows it, and others pump up for their matches in various ways. In one scene of the movie each armwrestling character shows off his macho side and his characteristic techniqures for pysching out the competition. This is followed by an interview where they talk civally about their techniques and about their strategies for winning. These scenes are classic. The uniqueness of these characters reminds one of the uniqueness of characters present in the Bloodsport movie as well. In a climatic match Lincoln Hawks (Stallone) faces the 5 time undefeated world arm wrestling chamption Bob "Bull" Hurley. Ironically the actor that portrayed Hurley was in reality a real world champion in armwrestling. Lincoln Hawks at first lets go during their armwrestling match; hence the need for the "strap" to prevent such from happening again. Bob Hurley head butts Lincoln and blood flows from his nose. "I own you" echoes in the background from Hurley as their armwrestling match proceeds. With looks that kill Hurley gives the appearance of the strength of a bear and the ferocity of a tiger. The look really has to be seen to be believed. As always Stallone the underdog achieves success inch by inch and never right away. He takes the former world champion over the top, grunting while bleeding in a truly passionate display of determination.